The sun is setting a little a lot earlier these days, but let us not forget…it’s still summer! We must savour every minute of the 17 days that remain in everyone’s favourite season. How? 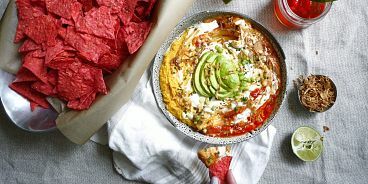 By planning one last camping trip, getting out to the beach and, of course, cooking up some summery Mexican favourites….like this twist on my favourite “Life Affirming Warm Nacho Dip”. This crowd-pleaser of a dish is over-the-top-delicious served chilled or warm. Its “to die for factor” (eg. what makes it extra delicious) is the smoky Organic Que Pasa Chipotle Salsa and the crunch that you absolutely must sprinkle on top. 1. Make one batch of ‘the cheese sauce’ from Oh She Glows’ Life Affirming Warm Nacho Dip (no need to add ingredients listed under ‘the dip’). Recipe here. 2. Fill your serving bowl with cheese sauce, leaving room for the sour cream and organic Que Pasa salsa. 3. Add salsa and sour cream, then garnish with green onion, fried onions and avocado. If you want to get really crazy you could add sliced black olives and pickled jalapenos. 4. Serve with Organic Que Pasa Red Corn Tortilla Chips (did you know these are the only organic, non-gmo project verified chip on the market that’s made with stoneground whole corn and real volcanic lava stone?). Enjoy! Thanks to Que Pasa Foods for sponsoring this post! All opinions are my own. Read more about how this great local company is making a positive difference in our food industry here and head to their recipe centre for more ideas on cooking with tortilla chips and salsa.